So I made it to Bangkok. The plane did not crash, fall apart or explode. Turbulence did not rip my life apart. I may not have slept since the 5am that I woke up the morning of, during the 6 hour flight landing me in Doha airport, nor for the 8 and something hours spent in Doha for my connection. I was still awake yet another 6 hour flight later arriving in Bangkok only to drop off now and again during the taxi ride when I had too little energy to remain vigilant. I arrived at the most amazing flashy W Hotel thanking my lucky stars that my hostel had somehow transformed into a palace, paid my taxi fare and relinquished my backpack to the porter. I proudly presented my printed out email confirmation from Hostelworld of my reservation and it was only then whilst glancing at the clientele at the hotel bar that it dawned on me that this was in fact the wrong place. The Thai receptionist was very forgiving and rather than making me feel like an impostor waited with me to get a taxi and instructed him how to get to WE Bangkok Hostel . I took a midnight stroll down the urban, a polite way of saying not fully paved, streets admiring the bright lights and breathing in the fresh humidity of polluted air. During this idyllic gander I heard the sound of a rustic alarm; a dog barked from behind a gate marking his territory. As it was dark I didn’t immediately see the menacing grey animal but did however spot an innocent looking brown puppy. All was well again until the adult revealed himself from the shadows. I rationalized there’s a gate separating us, he’s behind the gate, meanwhile my friend chimed “you should never run from dogs“. I settled for speed walking and it wasn’t until I glanced over my shoulder that I knew the little fucker was now over the gate. Still she reiterated “Do not run”, and I conceded to ignore the dark cloud following us when all of a sudden my friend picked up her feet and ran into the distance. I was still up a further 5 hours later only to fall asleep in a fresh bed ironically to the sound of air-con that sounded like a melody of airplane’s engine – music to a flying-phobic’s ears. It has all been worth it. Bangkok is unreal, I could not imagine it before my departure and I am grateful for my lack of any preconceived mental image. Stay tuned for my Thai travels, I’m sure this awkward turtle will have a few tales to be told once I’m through. Until then this is adieu; I don’t post and travel. Categories: Life, Travels | Permalink. Tomorrow I take flight for the first time in 2 years. After a month of serious and thorough obsession over my preoccupation with death via aeroplane I still feel emotionally fraught at the thought of flight. Ready to take on the actual adventure – next stop Bangkok! 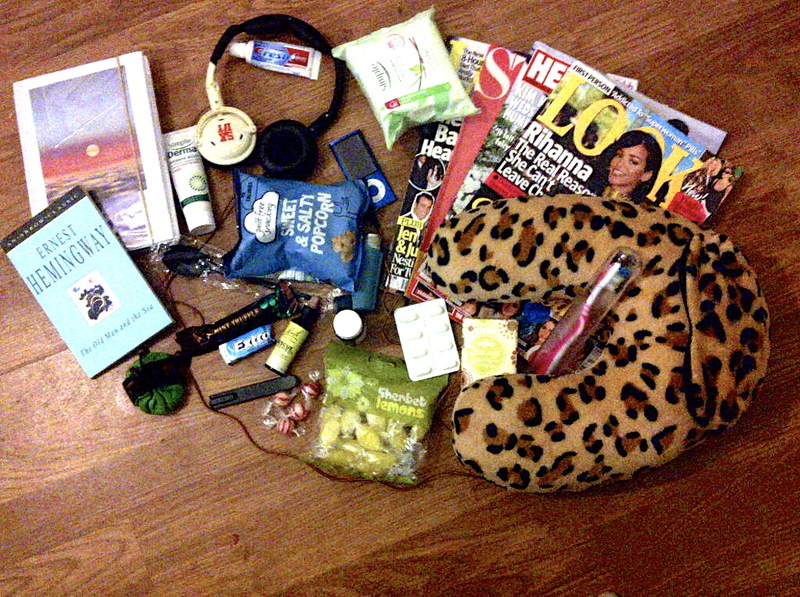 A snap of the items that will keep me sane: Magazines for mindless stimulation, face wipes, toothbrush, snacks and more snacks, notebook with relaxation tips, Ernest Hemingway’s The Old Man And The Sea, Rescue Remedy, sucking sweets, flight pillow for a good snooze and what would I be without my iPod loaded with a breathing meditation compilation. And a Disney playlist…yes I said Disney! – I added a video by Steve Pavilanis on a 10 second anxiety-busting technique. His voice is very soothing and for some reason comforting, check out his website A Life Less Anxious for tips on defeating anxiety. Categories: Uncategorized | Tags: aeroplane, anxiety disorder, depression, panic attacks, phobias, stress | Permalink.